Yes, I’ve tried zumba. and no, I didn’t make a complete fool of myself. Know what else I tried? White Radish Greens Soup with Tartine for breakfast just before my 9 a.m. zumba class. The soup was cold and refreshing, and the White Radish Tartine was heavenly and almost made me late for class. (I was deliberating over seconds.) My taste-tester son Andrew devoured 2 White Radish Tartines for his breakfast and gave 2 thumbs up. In a large pot over medium-high, heat oil and sauté onion for 3 minutes. Add scallion and radish greens, salt and pepper and sauté another minute, until wilted. Add the water and potatoes and cook for 20 minutes, until softened. Purée and add milk. Serve hot or cold for breakfast, lunch, dinner or snack—perfect for a picnic—and serve with White Radish Tartine. It’s like a trip to Paris without the airfare. In a small bowl, combine radish, oil, lemon, scallion, salt and pepper. Refrigerate for a few hours or overnight to marinate. Coat grilled bread with goat cheese. Top with marinated radish. Serve with soup. 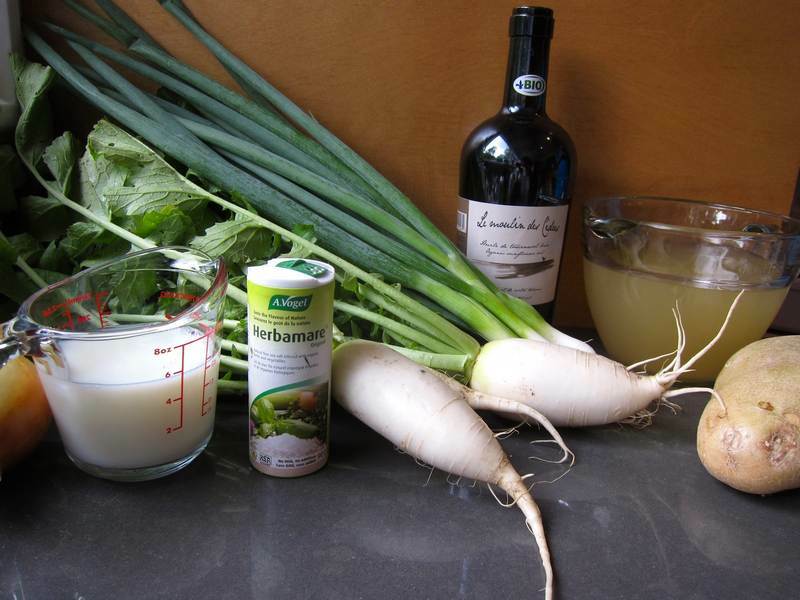 CSA Box Week 2: This harvest to table recipe was inspired by La Terre Bleue’s lovely white radish, topped by astonishingly abundant, fresh, green leaves and these 2 recipes: Grandmother’s Radish Leaf Soup and Bavarian Style White Radish Salad. Dying to know how to make quick pickled radish or radish raita? Have you seen the revised list of Jittery Recipes and their ratings? This is a nice idea. never thought of radishes for a chilled soup. Makes sense, though. Hi Jovina! Thnks for stopping by. 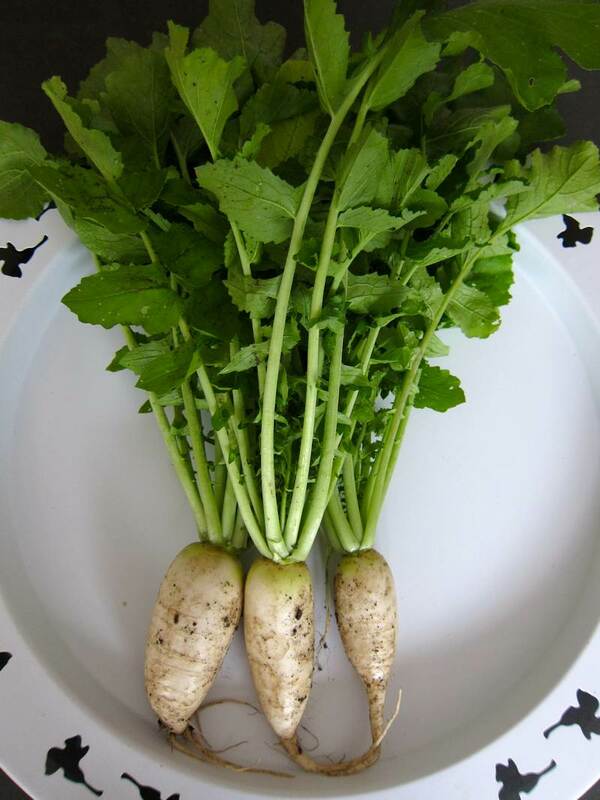 It isn’t radish in the chilled soup, it’s the radish greens. Love the white radish tartine and greens. Are they less spicy than the red variety? Similar but the dressing tempers the bite. Do you think would taste as good with red radish greens? My leaves are slightly picky to touch so wondering if that would affect texture and taste. and btw…I have a zucchini ripe for the pickin’ – any plans for zucchini recipes? Good question! I have no idea about red radish leaf soup. Maybe it could be mixed in with some other greens. Have a wonderful zucchini recipe coming up. Will send you a sneak preview.